Puzzle: Beautiful view of a harbour, with colourful reflections, sky in sunset colours, birds, boats, and a cozy cafe table with a green umbrella, a vase of flowers and a glass of wine. Easiest places to start are the sky and its boundary with the buildings, the green umbrella, the blue and turquoise boats, reflections on the water, and the table. Buildings, boats, flowers, chairs, and the rest of the image falls into place afterwards. A wonderfully beautiful and relaxing puzzle. 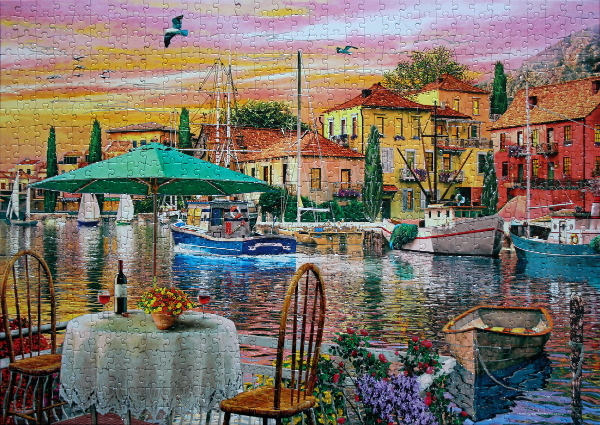 750 pieces, harbour, Mega Puzzles, puzzle, puzzle zen, Reflections. Bookmark.